Thank you to those of you who commented on my previous post to let me know that your basic Kindle or Nook e-readers are not backlit and therefore, not a source of blue light. My apologies for making an incorrect assumption and lumping all e-readers in with tablets, computers, i-Phones and similar devices. 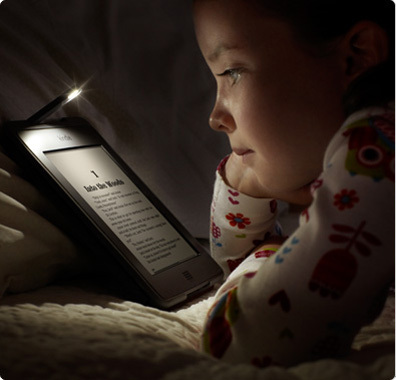 If an e-reader is backlit, it is probably a source of blue light. If it is not, it probably isn’t. My source mentioned that Barnes & Noble and Amazon both declined requests for interviews regarding the blue light issue. Since the Kindle Fire is backlit, it may be a source of blue light. I couldn’t find any product specifications that indicate whether the Glowlight technology emits blue light or not. Harvard Health Publications lists LED lights as a source of increased blue light and the Simple Touch does use LED lights. Those of you with e-readers, please add your observations to the conversation. Which device do you use, do you know if it is a source of blue light and have you noticed any change in your sleep patterns when you use your e-reader?